Levera National Park is located at the northeastern tip of Grenada. From Lake Antoine, go north to the roundabout at River Sallee. Turn right to enter the park. The mangrove swamp, one of the country's largest, is the northern most extension of the scarlet ibis and the only place it roosts in Grenada. The park includes two conical-shaped hills. The one on the mainland is Levera Hill, the other forms an island called both Sugar Loaf and Levera Island. 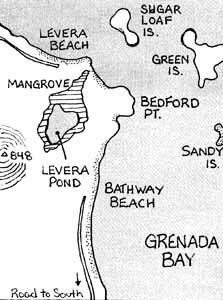 Twenty-three acres of seawater are collected between the two depressions in Levera Pond, surrounded by red and white mangroves. Coconut palms, cactus and woody scrub grow in the upland regions next to the pond. The coastal sand beaches are important turtle nesting sites. You can walk the road for about 1.5 miles to the beach and its facilities. On your right will be Sandy, Sugar Loaf and Green Islands. It's also possible to walk around the mangrove area. Bathway Beach is popular with locals on the weekends but often virtually deserted during the week. Because of its popularity, rental villas are available near Bathway Beach.